The Representation of the People Act was passed in 1918 and granted the vote to servicemen over the age of 19, to all men over the age of 21, and to women over the age of 30. Although it did not grant everybody the equal right to vote, this was a momentous change and formed the foundation which led to women over 21 achieving the same voting rights as men in 1928, with the passing of the Equal Franchise Act. 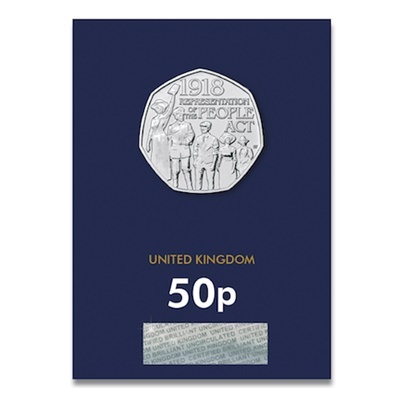 To mark the 100th anniversary of this significant year, The Royal Mint has issued a commemorative 50p for 2018. The obverse of this 50p features Jody Clark’s portrait of Her Majesty Queen Elizabeth II.